You probably remember encountering one of these sites: out-of-date, built in Flash so the graphics looked really cool and flashy (if you were lucky), but the overall experience was unintuitive. It was hard to figure out what to do next; you couldn't find much helpful information. In other words, lousy! The Wear-Dated carpet fiber website was all that and much less. It hadn't been updated in three years. Because it was built on Flash, content couldn't be easily updated without major programming expenses, and search engines couldn't understand what the site was about. "Because search engine web crawlers can’t read the text or content of a Flash-based website very well, it’s quite difficult to optimize this type of website. The fact that you can’t add alternative text to the images in a Flash site just adds to the problem, as does the fact that the links are not standard HTML links and are difficult for the web crawlers to follow. Altogether, these issues make it hard for Flash website to rank well in the search engines." Needless to say, we had to take action so the site could support an updated marketing campaign and provide value to retailers selling carpet made with Wear-Dated carpet fiber and also direct consumers to those stores. What's important in a website redesign? Here's what I consider important in a redesign. Definitely opt for an easy-to-use content management system (CMS). You need to be able to administer your entire website easily and without needing a degree in coding. That's why I'm partial to HubSpot. I can tweak, update, add, change and revise on the spot. You want to keep your website fresh and up-to-date. Just as in your store or office, you don't want cobwebs. When you have a user-friendly content system, doing so is easy. Not only do you want a CMS that allows you to easily edit pages, but it's important to be able to add pages, remove them or redirect them as necessary. I want a CMS that allows me to create call-to-action buttons (and track stats) as well as integrate keyword topics and content strategy throughout the site and monitor search engine optimization (SEO) opportunities. You must have content, and your content must be robust and exhaustive. That means having no contraints on adding words and images to a page, not to mention being able to publish blog articles on your site. 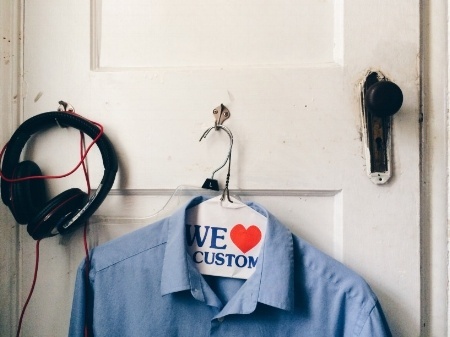 You must be able to provide value to your visitors. That starts with a thoughtful customer experience and the ability to easily create landing pages, pillar pages and blog articles that deliver valuable insights. 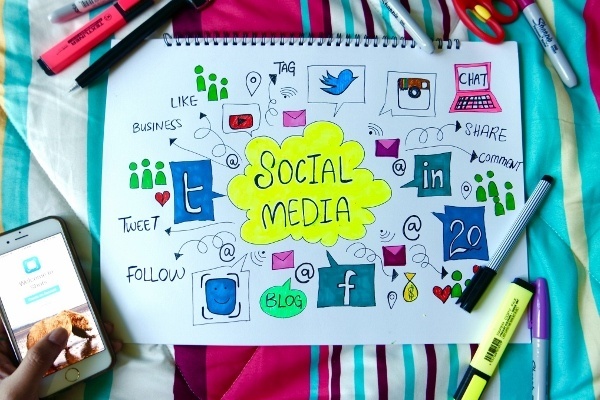 You need to have systems that allow you to integrate with social networks. That can be through your content management system, or other software solutions that allow you to publish on the network important to your audience and monitor the interactions. Your website solution needs to embrace the principles of inbound marketing so you attract the right audience, convert that audience into leads and then nurture them into becoming customers. >> Explore the Guide to Successful Inbound Marketing to learn more. Back when this redesign took place, mobile devices barely registered. Today, however, you must take into account the mobile experience. >> See Is Your Website Mobile Friendly? If Not, Consider Responsive Design. What were we considering in 2008? This is where I get excited about my reminiscences. For maximum effectiveness, you need for search engines to “see everything.” That means that you can't hide “text as images,” you need to make sure that content is relevant, and if you have anything that you want search engines to find -like products and retailers- you have to make that easy for web crawlers to find. With the exception of one homepage graphic, the new site intentionally used no Flash. And, the new system dynamically generated a unique page for each carpet and retailer – allowing search engines to find and link to core content with ease. From the perspective of improved usability, the Wear-Dated website redesign greatly enhanced the user experience, revising navigation and functionality by focusing on the visitor's perspective. The site - which unfortunately is no longer availabe - offered a Sales Assistant, Featured Carpets, Carpet Catalog Search, and Search functionality for the entire site. It included real carpet images rather than simulated carpet in the Room Viewer. The Retailer Locator offered improved map functionality to make it even easier for visitors to find dealers near them. The new site featured advanced search functionality so all content types were internally searchable. Advanced results show a thumbnail of each result and offer additional resources. The site included a very flexible Newsroom so Wear-Dated had near limitless expansion possibilities, as well as the ability to conduct eNewsletter campaigns and contests to engage visitors and bring the product category to life! Finally, the site offered Comment and Ranking for both Carpet and Retailers, providing both carpet styles and individual retailers an opportunity to stand above the rest. Remember that this redesign took place in 2008. And, yet, many of the forces we pay attention to today - such as Google and Amazon - mattered then, too. Back then, we were aware how websites like Google and Amazon had forever changed buyer behavior. When faced with a large or complex buying decision, customers routinely conducted online research to determine exactly what they need, how much is fair to pay and from whom they should get it. The more complicated the category, the more important it is to offer a robust online experience. Carpet is a complicated category. So, for customers wanting to find carpet -given how many choices are out there- how can anyone make a confident decision? That's where Wear-Dated’s online tools helped to make this selection easier. Visitors could learn all there is to know about how carpet is made, tested and categorized. They could find carpet by color, style or use (i.e. : what carpet is best for Kids?). And, if they still weren't sure, they could see which carpets other people thought were best and why. 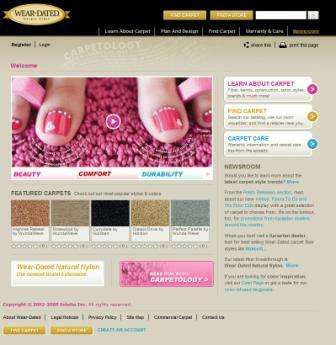 They could also get maximum detailed information for any carpet on the website (available colors, durability rank, etc. ), and see the carpet in a series of rooms to help with the selection process. Then, there was the process of finding a convenient and trustworthy retailer. The new Wear-Dated.com elevated the retailer “heroes of the industry” by empowering customers to document their experiences online as comments and ranking. All feedback was closely monitored so retailers could turn any issues into relationship building interactions, thereby creating further positive feedback. Word of mouth is any retailer's most powerful marketing tool – Wear-Dated leveraged this principle on an international scale. Combined, these customer centric features and content made the Wear-Dated site a site worth spending time on, exploring, and returning to. Should a site user wish to share the word, we even added social bookmarking tools to make that easy as well. In those early days, we tried to leverage the social web on the Wear-Dated website. At its core, the social web is about building connections with individuals or groups that share common interests that can range from the practical to the leisurely, yet all relate to those who engage in the conversation. Yes, even now. The insights resulting from social interactions are truly invaluable! Fast forward almost ten years and it's no surprise how that interaction has evolved into searchable online and social reviews that can make or break your business. And the results of this flooring website redesign? The new website ranked high organically on specific search terms within a short period of launching, despite spending no marketing or advertising dollars to promote the site. The new website was self-administered and we quickly realized significant savings by not having to rely on an IT department to upload changes and updates. We also discovered that the turnaround on updates was instantaneous, significantly improving content freshness and enabling us to quickly react to the kind of SERP results obtained above. Finally, we made the Wear-Dated brand more visible and relevant to consumers learning about carpet, shopping for carpet or wanting to know more about caring for their carpet. Have you had to redesign a website? If you've gone through a website redesign, what impressed you about the process? What worked and what would you do differently?